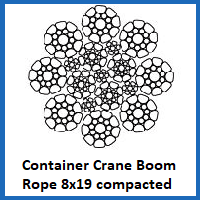 As the container crane boom rope 8×19 compacted construction suggests, this wire rope is used on the boom of container cranes and is configured with eight outer strands. Its high fill factor gives it great crush-resistant qualities, as well as a high breaking load limit, important for safe lifting to occur. act in terms of the properties it affords. In the case of this 8×19 construction compacted boom rope, the headline features include excellent breaking loads and outstanding resilience in the face of crushing impacts. It is not designed to resist rotation, so needs to be used in situations where tension is always applied and it has no opportunity to twist. On the boom of a container crane it will find itself right at home. At the start of the range sits a 6.4mm diameter wire rope, and there are eleven different options in total. The sturdiest boasts a 238kN minimum breaking load, which is worth taking into account as you make your selection. For other crane rope products, see our full range and take your pick. We offer other container crane rope constructions, in addition to rope for ship cranes, tower cranes and a host of other lifting equipment. Rope Services Direct is all for aiding customers who are uncertain about which wire rope is best for them. To chat with an expert, simply call 01384 78004 and someone will speak to you. To receive an emailed response, fill out the contact form with your details. 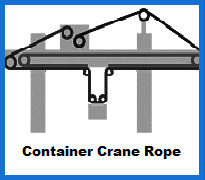 Container Crane Boom Rope 8x19 Compacted Construction Overall rating: 5 out of 5 based on 6 reviews.